Peas are in the same food family as peanuts and may cause an allergic reaction in people with a peanut allergy, according to Allergic Child. A pea protein allergy is an adverse reaction of the immune system to the specific proteins found in peas. If you experience an adverse reaction to peas when you eat or touch them, talk to your doctor about allergy testing for an accurate diagnosis. Although unlikely, a pea allergy can lead to anaphylaxis, a life-threatening allergic condition. A pea allergy is caused by an overreaction of the immune system to the proteins found in peas, according to MedlinePlus. The body doesn't recognize the proteins as safe, so it creates a defense system to fight off the pea proteins. IgE antibodies enter the bloodstream and begin a chain reaction that causes mast cells to produce high levels of histamine. Histamine leads to inflammation in soft tissue, causing common allergy symptoms. Symptoms of a pea protein allergy will include respiratory complications, digestive difficulty and skin reactions, according to MayoClinc.com. Respiratory complications include shortness of breathe, wheezing, coughing, sneezing, nasal congestion, itchy eyes and throat irritation. A pea protein allergy can cause abdominal cramping, vomiting, gas, bloating and diarrhea. Skin reactions include general itching, hives and contact dermatitis. 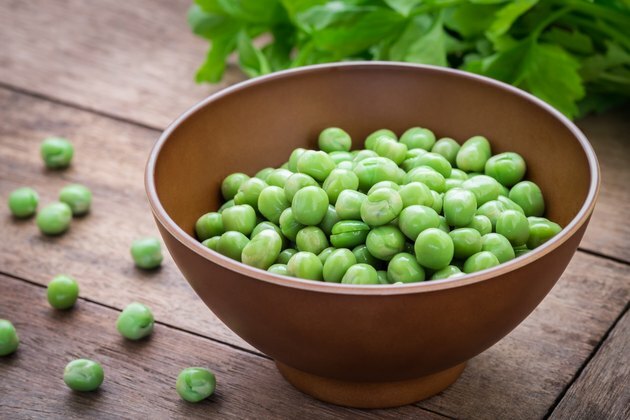 Avoiding exposure to peas is considered the most effective treatment for a pea allergy, according to MayoClinic.com. Mild symptoms from a pea allergy can be treated with an oral antihistamine. Antihistamine drugs restrict the body from producing histamine, reducing allergy symptoms. Skin reactions are treated with topical histamine creams and corticosteroids to reduce inflammation and itch. MedlinePlus warns anaphylactic shock is a risk with food allergies. Anaphylactic shock is an extreme allergic, whole-body reaction that causes the body to experience a state of shock. Extreme levels of histamine are produced, leading to inflammation in the lungs, a sudden drop in blood pressure and a rapid heart rate. Anaphylactic shock can lead to death and requires immediate medical intervention. Someone with a known severe allergy to peas should carry an epinephrine pen on her person at all times for an emergency. MayoClinic.com recommends someone with a known pea allergy wear a medical bracelet. Ask questions about the ingredients in certain foods when eating out and read packaged-food labels. If you're even in doubt if peas are in a particular food, don't eat it.